One of the things you learn to love (or dislike) about software is the fact that it is never done. There are always improvements, fixes and OUR favorite, upgrades. Here at Bundle Post we are currently 30 days into a 60 day development cycle that will inevitably start all over again with our next feature set. Today however, we are announcing a mid-version upgrade that includes several substantial “under the hood” system improvements that result in a large group of features and enhancements that we think you’re going to love. The new features are all focused on improved social media management, content discovery, ease of use and greater social media content management efficiencies and effectiveness. We will cover each new feature and enhancement included in this release one at a time and also detail the advantages and changes you can expect. Without a lot of fluff, let’s get right to it. You can now inline edit the text of social media posts right on the export table, in real-time. We have also made it so that edits made to the text of a post on the Export Table will also save that edit to the original Feed Channel, My Content and Follow Friday posts in the database, not just for that export. Previously, the only way to edit or curate the text of aggregated content within Bundle Post was by viewing a feed from the Feed Channel page in the system. Today that changes. We know that social media and content marketing is far more effective when the content being shared is curated, rather than simply aggregated and shared. Meaning, adding context to the post beyond just sharing the title. Aggregation is collecting and posting or Retweeting other people’s content through your social media accounts, where curation combines aggregation with added comments, questions or otherwise editorializing the post by adding context to the content being shared. Curated content always gets higher click-through rates, conversation, engagement and overall results as compared to aggregated content posting alone. The curation function on the export table makes this incredibly easy and efficient for Pro users of Bundle Post. As with other major system upgrades, the new curation feature is being added to Pro account types only. Expanded users can upgrade to Pro for double export quantities, Auto-sort functionality as well as the powerful new curation feature. *note: Curation edits made anywhere in the system will be saved to the database for you. The next time you want to share a post you have curated, the original edit you made will appear. You will be able to edit posts over and over as you see fit and the last edit of a post will be saved to the respective Feed Channel, My Content or Follow Friday folders. **To edit the text of a post on the Export Table, simply double click on the text, make your edits and press “enter” or click the OK button. Bundle Post now tracks which content you export from all Feed Channels and removes that content from the corresponding feed once you have exported it. This function is done automatically for you every time you do an export from the system, ensuring that your Feed Channels contain only the latest unused content automatically. *Don’t fret though, we have added two additional features for content you want to keep and share again or share from another schedule. We have also added something for YOUR blogs’ RSS Feed. See the awesome new “Content Flags” and “Blog Ownership” features below!! Connected to the Sanitizing feature is a change to content deletion within Feed Channels. Previously when you deleted a post you did not want to use from a Feed Channel, it could appear in the channel again, at the next ingestion of content for that feed. Now, Bundle Post tracks the content you delete and does not ingest deleted posts to your Feed Channel again, making managing shared and curated content much easier. The changed delete function is designated with a new image next to every piece of content, anywhere you view a Feed Channel post in the system. Hitting the graphic will remove that post from that Feed Channel permanently. 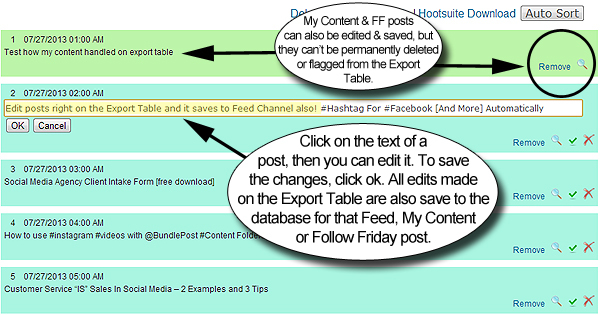 You will still be able to remove a post from the Export Table without permanently deleting the post from a Feed Channel. This feature is now clearly marked with a text link labeled “Remove“. Clicking to remove a specific post on the Export Table will remove that post from the export you are working on, but will not permanently delete it from the corresponding Feed Channel. From anywhere in the system you view content ingested from Feed Channels, you can now FLAG posts that you do not want the system to remove from a feed, so you can use it again later or use it for a different schedule export. 1) Pre-select content for a different schedule or social account at the time you are conducting an export for another schedule. 3) Efficiently “flag” content you want to share again from a specific Feed Channel. The new Flag function is designated with a new image next to every piece of content, anywhere you view a Feed Channel post in the system. Clicking the graphic will flag that post with the flag and designate the post to be kept in that Feed Channel until you delete it, even if you export it. 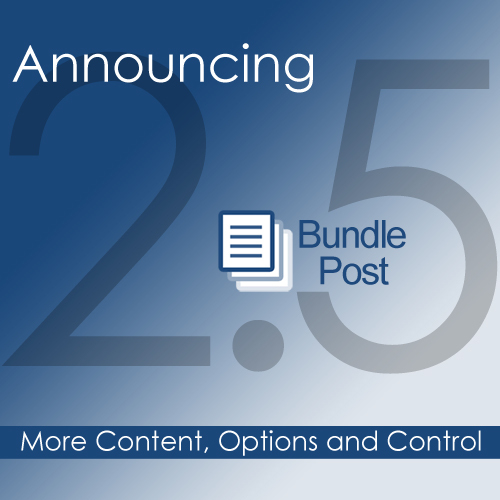 Bundle Post now allows you to identify a Feed Channel as being you or your clients’ Blog. This new feature makes all content evergreen in that channel, no matter how many times you export it, without needing to flag content manually to be kept in the Feed Channel. For example, if a Feed Channel you have added to Bundle Post is your blog, a clients’ blog, or simply an RSS feed you never want content to be removed from, simply click the next to the feed name on the Feed Channel page to turn it on and the system will automatically keep all content in the feed up to a maximum of 250 posts. As the feed increases beyond 250 posts, the oldest will drop off, leaving the newest content in the Feed Channel for you. We were not at all happy with how the system ingested, saved and added content to Feed Channels. Without getting into the technical details, the result of how it worked made the quantity of content you had available extremely limited from both alert feeds and even RSS. Today we are announcing that we have made substantial changes to the core content ingestion system that will now be appending content to your feed channels, rather than overwriting content every time it ingests. The end result is that Feed Channels will now grow to the most recent 250 posts, instead of overwriting with the few most recent posts four times per day. The system will still ingest content multiple times everyday, but the difference is that all new content found will be added to content discovered previously, up to 250 posts. This will increase the amount of content the system has available for you to review and share and most importantly give you more content options. We have enhanced the interface screens for viewing content to include icons for view, delete and the new flag function. This new interface has been implemented to every location within the system that you view posts from a Feed Channel. The Export Table interface includes these new icons and functions but also has the addition of the “Remove” option we discussed earlier. 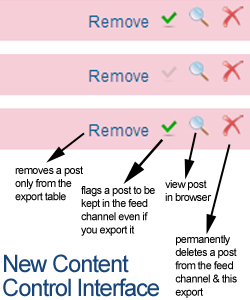 Remove works as the old delete option used to, in that it only removes a post from the export table, but does not delete the post permanently from a Feed Channel. The long text descriptions included with each post inside view Feed Channel and selecting content for the Export Table have been removed, making a cleaner interface when viewing and selecting posts. An on hover function that will display the lengthy description previously shown for every post, as well as thumbnail images for posts will be added to the interface sometime following this major release. Finally, we have added a icon to the view Feed Channel and select content windows to visually show posts that you have already used in a previous export. We have also addressed a few additional issues that had been reported in the system. As you can see this Bundle Post 2.5 release is packed with a ton of new features, upgrades and enhancements that go even further to help you be more efficient, effective and profitable with your social media marketing efforts. This release is an interim step to the next 3.0 version that will also take the system and social media management to new levels. Be sure to give us your feedback and comments on the new version. If you are not currently using Bundle Post, we invite you to get your free trial and request free one on one setup and training with our customer support team. woweeeee, very very nice job, everyone! thanks for this important upgrade. I love it all, and it will certainly streamline the process even more for me (and make me more efficient and effective for my clients). Bravo. Yay! Love being able to edit in the export table, as usual BundlePost is just getting better and proving that when you put your customers first, it makes you a better company. Thank you & congrats on a job fantastically done! So glad you like the improvements Kerri! Just got done exporting a specifically targeted campaign, and LOVE the ability to edit in the export table. Handy, and I was able to see how the edits “stuck” when I went to put the same messages into a second export for another Twitter account. I need to get in there and practice with the feeds, remove, etc. But I’m confident I’ll love the functionality there too! Great job – Thanks for the continuous improvements and strive for quality that make me and my clients look awesome!! So glad you like the upgrades Keri. There is a ton that was done under the hood to make all this happen and it also paved the way for some additional big improvements that will be coming. We love the feedback we are getting and the improved results everyone is already seeing.